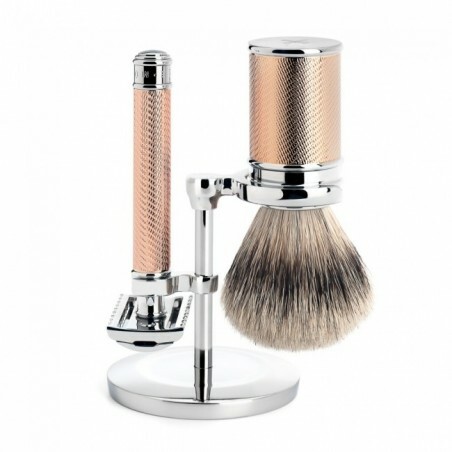 Chrome Stand for brush and razor. Comfortable chrome stand with the perfect dimensions to allow for your brush to be correctly hung. Keeps your razor and brush in pristine condition. Silvertip Shaving Brush 31M89RG handmade. It is fitted with a rose-gold chrome handle that is anti-slip. Natural hair of extraordinary quality that stands out for its softness and performance whilst shaving. R41 Classic Razor rose-gold Open Comb. Very precise and ergonomic razor. 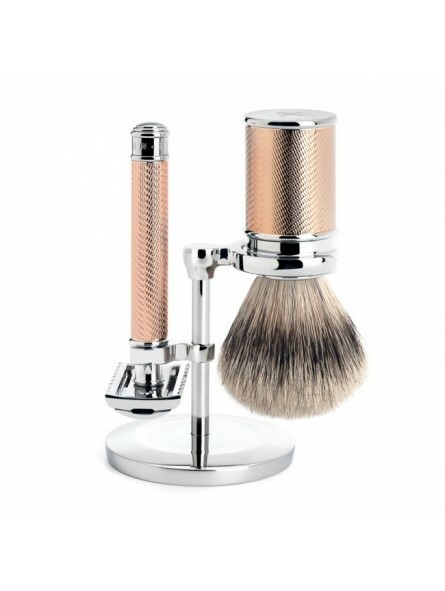 The Mühle design combines high quality metal (chrome coating) with an exquisite engraved handle. The engraving improves the grip and avoids the handle slipping. A perfect set that allows you to experience a great shave.